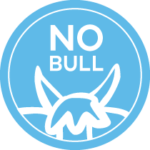 When you need a soundproofing solution that is affordable, effective and suitable for a variety of environments, turn to Soundproof Cow. 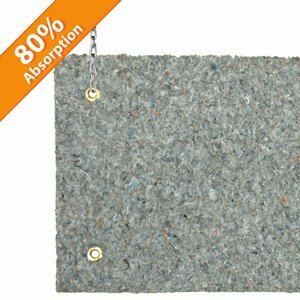 The cost-effective sound-absorbing material in our Echo Absorber Hanging Baffles is just the solution you have been looking for. Finding cost-effective sound-absorbing materials can be a challenge, especially if you have a large room to soundproof like a cafeteria or a concert hall. Fortunately, with Echo Absorber hanging baffles, you don’t have to cover the whole room in soundproofing sheets. Just a few of these baffles will absorb a tremendous amount of echo and reverberation at low, medium and even high frequencies, leaving you with clean sound and effortless communication. 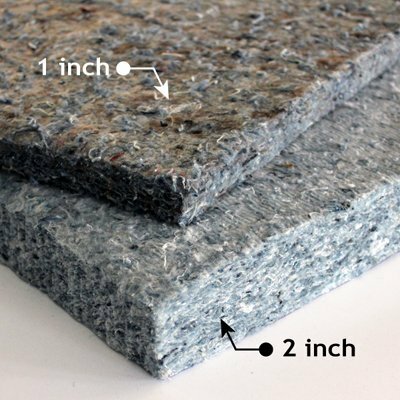 These are lightweight, thermally-bonded, mold- and mildew-resistant 1-inch panels that soak up harsh sound. Hang them from ceilings in your recording studio, your office or in your home and enjoy relief from the typical competing loud, harsh noises you normally experience. These are environmentally-friendly and Class “A” fire-rated, so you can use them just about anywhere. There are no VOCs (Volatile Organic Compounds) to potentially make anyone sick. They meet the flammability code requirements of most buildings. If you thought that your venue was too large or expensive to soundproof, think again. 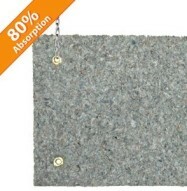 Then order a case of these amazing 1-inch Echo Absorber™ Hanging Baffles. You just might decide it was one of the best investments you ever made. Order yours right now! Echo Absorber™ Hanging Baffles are a cost effective, ceiling hung solution for areas that suffer from extreme levels of noise caused by echo. They offer excellent noise reduction qualities in low, middle and high frequencies. Echo Absorber™ Hanging Baffles are Class A™ rated and will meet the most stringent building codes requirements for flammability. 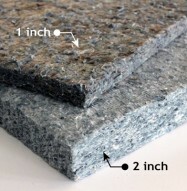 This product is a light weight, thermally bonded acoustical pad made from recycled cotton fibers. Echo Absorber™ Hanging Baffles do not contain Volatile Organic Compounds (VOCs), fiberglass or formaldehyde. This easy to install product is fungi, mold/mildew resistant. Use this product when echo is an issue and budgets are tight. Acoustic Performance at a Great Price — Echo Absorber™ Hanging Baffles are one of the most cost effective, sound absorbing materials available. The natural cotton fibers are acoustically superior when compared to other man made fibers, such as fiberglass and cellular foam. The noise reduction performance of Echo Absorber™ Hanging Baffle products matches other higher priced material on the market. See acoustic data below. Keep it Green — Echo Absorber™ Hanging Baffle is 80% recycled cotton and does not contain Volatile Organic Compounds (VOCs). Quality — Echo Absorber™ Hanging Baffles are a thermally bonded, cotton panel made from high quality recycled fibers. 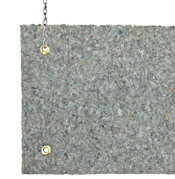 The thermal bonding makes Echo Absorber™ Hanging Baffle products tear and impact resistant. 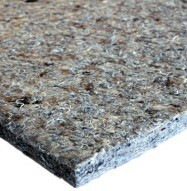 Echo Absorber™ is resistant to fungi and mold/mildew. Your baffles come with 4 heavy-duty, marine grade grommets to ensure product longevity. Easy to Install and Handle — Echo Absorber™ Hanging Baffles are light weight and can be hung with light-duty chain and s-hooks from trusses or other structural elements. These baffles contain no fiberglass and do not itch or cause skin irritation. Echo Absorber™ Hanging Baffles can be hung consecutively to maximize limited space. Flexible — Echo Absorber™ is a flexible acoustic panel that can be installed on curved walls or wrapped around objects such as columns and posts. Excellent Flammability Rating — Echo Absorber™ Hanging Baffles have a Class A™ flammability rating. This product passes most building code flammability requirements for exposed materials. Materials Needed: Light-duty chain (medium-duty chain if more then 3 baffles hung consecutively), S-hooks. I am glad I found you, baffles have working perfect. Didn’t have wall space to put on wall, so I hung baffles instead. Has done a great job stopping all the loud noises from machine in warehouse.